What will make 2015 a successful season for Notre Dame? Earlier today we discussed the best QB corps in the Nation. This afternoon, we return as TSS Associate Editors Bart Doan and Terry Johnson join Kevin Causey and rotating special guests in our weekly roundtables discussing all things college football. This morning we brought up the fact that Brian Kelly said he would take his quarterbacks over Ohio State’s. After an 8-5 season, Kelly needs to have exceptional performances from the quarterback position and that leads us into our question for which we are joined by the one and only Subway Domer. Question: Let’s take a deeper look at Notre Dame. 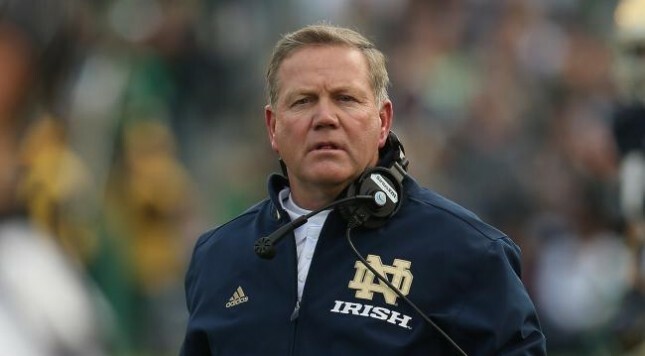 It’s early but what makes this a successful season for Brian Kelly and what is the swing game that could make or break them? There are two very obvious answers and they are Georgia Tech (triple-option) and USC. However… Given the obscene amount of returning starters, two quarterbacks, opening weekend, and a home night game; the Texas game is looking more and more like the game to define the 2015 season for Notre Dame. Sure, a lot could happen after that game either good or bad, but if “make or break” also means “tone setter” then this game is on the level of importance. Texas is no Savannah State- but they’ll do. Successful season? At Notre Dame? In the 5th year of a head coaches tenure? HAHAHAHAHAHAHAHA… As delusional as it may sound to some, anything less than a championship is a failure. However… If the Irish can make the playoffs (or even get snubbed atrociously by that ND hating committee) then there should be some level of satisfaction in South Bend and across ND Nation. Full disclosure: Kevin is good at coming up with questions. This is a good one. You start looking at Notre Dame’s schedule for 2015 and you see that it’s tough as is typical for them, but there isn’t a game that seems un-winnable, and I get that’s a fake word. Thorny games against Michigan and Michigan State are gone. The annual “Purdue is going to give Notre Dame all the hell they can and this will be the best they play all season” game is gone. Florida State is nowhere to be found, and neither is Oklahoma. Southern Cal is still there … but that’s in South Bend. The only road game they’ll see before late November against a team that will be around the top 25 is Clemson, and that most certainly can be a loss. But aside from that one, it’s really hard to find another single game the Irish won’t enter as favorites in 2015 until that last weekend tilt against Stanford in Palo Alto. Which means that Notre Dame should reasonably expect to contend for a top 10 spot and if things roll the right way, a playoff berth. ND was ravaged by injury last year (but really, so is everyone for the most part in football), so they should have reasonable expectation of being healthier. I don’t know if you’d consider it to be a “swing game,” but I think the opener at home against Texas is massive. Week one games set the tone for how all that work in the spring, summer, when the lights are off and the coaches aren’t even watching … pays off. Losing can be devastating, and in college football, can also be fatal at any point in the year to your preset goals. So I reckon that one’s a big deal. They also have a four game stretch of Georgia Tech, @ Clemson, Southern Cal, and Navy (sandwiched in by what will be a crushing of UMass) in the middle of the year that could find a loss or two as well if they don’t play up to snuff. Really, if you’re a Notre Dame fan, you should go in with the expectation of a playoff run, or something close to it. It sure looks like the 12-1 season is the exception and not the rule, doesn’t it? In five seasons, Kelly has only once won double digit games at Notre Dame. Naturally, that’s what will make this a successful season for the Irish. They must win a minimum of ten games. If they don’t then Kelly will have six seasons under his belt in South Bend with only one season with more than nine wins. That’s not much of a legacy and at that point the natives are going to really start wondering who they can get that can make them a consistent winner. Let’s head over to our buddies at FBSchedules and take a look at Notre Dame’s 2015 schedule. Out of those five teams, which loss would hurt the most? The opener against Texas could go either way and if Texas wins then it’s because of Charlie Strong, not because of Notre Dame. If they lose to Clemson, that’s ok because DeShaun Watson is the truth. USC? Cody Kessler and Sark have it going on. That leaves Georgia Tech and Stanford for me and because of the timing of the game I’m going Georgia Tech. Heading into the Georgia Tech game, the Irish should be 2-0 but could also be at 1-1 if they slip up. After a season in which they went 11-3 and beat both Georgia and Clemson, the Jackets are flying under the radar. With Justin Thomas at quarterback, the Tech offense is as dynamic as it’s been since Joshua Nesbitt left and in their last six games of 2014 the Irish gave up over 200 yards rushing against every team except Arizona State. Notre Dame is not supposed to lose to Georgia Tech but Georgia Tech is going to be a problem for the Irish. Mark it down. Forgive me for saying this Notre Dame fans, but the only way for this season to be considered a success is for the Fighting Irish to capture a spot in the College Football Playoff. Let’s be honest: the Notre Dame teams of yesteryear expected to compete for a National Championship year in and year out. Winning eight or nine games per season simply wasn’t good enough. Nor should it be this year. After all, 19 starters return from a squad that was just a handful of plays away from winning 11 games in 2014. With that type of experience coming back and favorable schedule in which Notre Dame plays most of its toughest competition within the friendly confines of South Bend, everything sets up nicely for a run at the championship this season. So, which game is the key to this season? Although every game is important when a single loss could destroy a team’s title hopes, the road game at Clemson looks like the most crucial contest to win. Sure, the Tigers lose seven starters on defense. However, with Deshaun Watson under center, Clemson will be one of the most explosive offenses in the country this year. A road win in Death Valley – where Dabo Swinney’s squad has won its last nine games – would give the Irish a signature win on the road, especially if the Tigers were to win the ACC. On the other hand, a loss to Clemson would likely destroy Notre Dame’s chances of getting into the College Football Playoff. Remember, the Selection Committee doesn’t use numbers to calculate strength of schedule: it only uses the “eyeball” test. With that in mind, it’s easy to envision a scenario in which the Irish miss the field because it lost to a “weak” ACC opponent rather than an opponent in a “stronger” power conference. Whether or not that “logic” would be correct is another story. Regardless, Notre Dame can take the decision out of the committee’s hands by winning at Death Valley. Go ahead and circle your calendars for October 3rd… this should be one of the 10 best games of the year. Which returning starter at QB will show the most improvement in 2015? Which first year starter at QB is poised to have a breakout season? Which non-Power 5 QB do you want as the face of your franchise? Which Power 5 quarterback do you want as the face of your franchise? If you could have attended any game in the history of college football what would it be? Who was the greatest team in the history of college football? Who was the most underrated team in college football history? What’s the most intriguing spring practice storyline? What changes should be made to spring football? In a one-game scenario, which college football coach would you turn to for a win? Which coach would you turn to if building a program from scratch?